The shipwrecked cargo of champagne and beer is believed to date from between 1800 and 1830. (CNN) -- First there was the discovery of dozens of bottles of 200-year-old champagne, but now salvage divers have recovered what they believe to be the world's oldest beer, taking advertisers' notion of 'drinkability' to another level. Though the effort to lift the reserve of champagne had just ended, researchers uncovered a small collection of bottled beer on Wednesday from the same shipwreck south of the autonomous Aland Islands in the Baltic Sea. "At the moment, we believe that these are by far the world's oldest bottles of beer," Rainer Juslin, permanent secretary of the island's ministry of education, science and culture, told CNN on Friday via telephone from Mariehamn, the capital of the Aland Islands. "It seems that we have not only salvaged the oldest champagne in the world, but also the oldest still drinkable beer. The culture in the beer is still living." Juslin said officials had talked to a local brewer about whether the new-found beer might be able to yield its recipe after experts decipher the brew's ingredients. 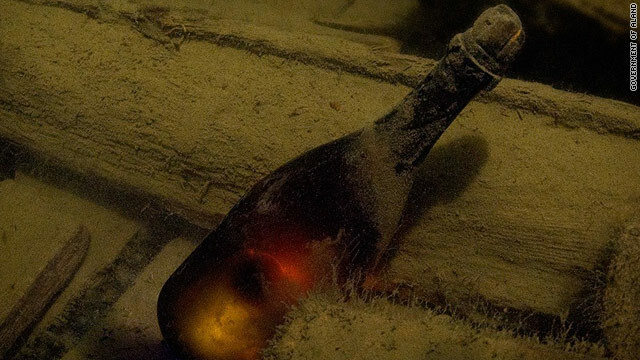 The newest find came as divers unearthed bottles separate from the earlier champagne find. While lifting a few to the surface, one exploded from pressure. A dark fluid seeped from the broken bottle, which they realized was beer. All the cargo on the ship -- including the beer and champagne -- is believed to have been transported sometime between 1800 and 1830, according to Juslin. He said the wreck was about 50 meters deep (roughly 164 feet) in between the Aland island chain and Finland. The cargo was aboard a ship believed to be heading from Copenhagen, Denmark, to St Petersburg, Russia. It could have possibly been sent by France's King Louis XVI to the Russian Imperial Court. "Champagne of this kind was popular in high levels [of society] and was exclusive to rich groups -- it was not a drink for common people then," Juslin said. Experts estimated the exclusive bubbly to be worth tens of thousands of euros per bottle. The value of the beer has not been determined. It is also unknown whether the beer went flat while sitting at the bottom of the Baltic for such a long time. Some of the bottles of champagne were originally produced by Juglar, a premium champagne house no longer in existence, according to Juslin. He said the cold sea water was a perfect way to store the spirits, with the temperature remaining a near-constant 4-5 degrees Celsius (around freezing temperature in Fahrenheit, or 32 degrees) and no light to expedite the spoiling process. Investigators and historians have not yet unraveled the mystery surrounding the exact origin of the ship or the date when the ship went down. Juslin said other artifacts were still lying in the shipwreck, but it would take several months to lift them out of the wreck. The islands are at the entrance of the Gulf of Bothnia, in the Baltic Sea. They have Swedish-speaking people, though the island itself falls under Finnish protection. The Aland chain forms a Nordic archipelago of more than 6,000 skerries and islands.